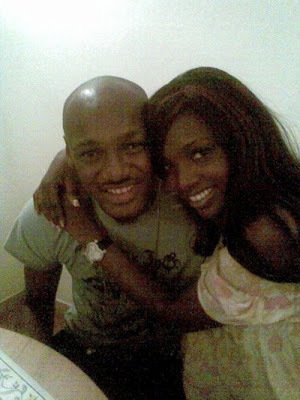 The forthcoming wedding between African Queen crooner,Tuface Idibia and his long-time partner, Annie macaulay,no doubt,will go down as one of the weddings of the year going by the pattern the preparation is taking. Information available to us has it that the about-to-wed lovers have gone on a shopping spree ,gathering items for the superlative wedding slated for next month; probably February 14,2013. The marriage committee is said to be working round the clock and as it is, it’s going to be a strictly by invitation affair considering the capacity of the venue for the wedding. The frenzy has already enveloped the social setting of Nigeria where the lovers are popular. They have a large assemblage of their friends and associates in Nigeria. The final decision on the event planner is still being kept under wraps, but there are two prominent event planners short-listed for the wedding. Annie’s wedding dress, we learnt will be made by Yvonne Nwosu of Vonne Couture. Brides’ maids include actress Kendra Etufunwa and TV personality Tana Egbo Adelana. Further digs revealed that their traditional wedding will hold in Abuja,Nigeria while the white wedding might hold outside the country, probably Caribbean Island. Tuface shocked many when he proposed marriage to Annie Macaulay,mother of his daughter last year’s Valentine’s day at posh hangout, club 10. Among those whom must have been caught by surprise with the musician’s commitment to Annie were the mothers of the multi-award winning artiste’s five kids,Sumbo Ajaba and Pero Adeniyi. The love story of Tuface and Annie span over 13 years. Their relationship suffered a setback in 2010, when it was reported they had parted ways but they later resurfaced in the social circuit dispelling the rumoured break-up tale. We put a call through Annie’s close friend, who is listed among the brides maids of the day and this is what she told us,” What do you want to know about them(Tuface and Annie)? I am sorry, we don’t talk to the press”, and the phone went off.